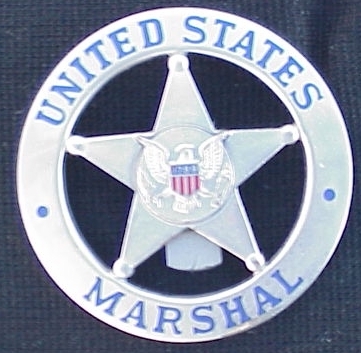 In the late 1800's and the early 1900's when the United States Marshals were under the Justice Department, some badges were ordered by the Justice Department. As far as it can be determined, these badges were circle and cut out stars. Some said "UNITED STATES MARSHAL" and some said "DEPUTY UNITED STATES MARSHAL" on them. They were hallmarked 'LAMB STAMP & STAT. WASH. D.C." or "LAMB & TILDEN BADGE CO. WASH. D.C.". These badges were sent to the Territories and Districts when the Justice Department received a request from a particular U.S. Marshal in writing or by telegraph. These badges were not accountable at the time. In 1972, when I interviewed T. P. McNamara, Deputy U.S. Marshal, Waco, Texas. He stated that when he helped the United States Marshal Service Headquarters move in Washington D.C. to the Safeway Building, there were two bushel baskets of circle and cutout stars. All that he had seen were made by the two above companies. He was given a couple hundred of them and he has given most of them away over the years. A. 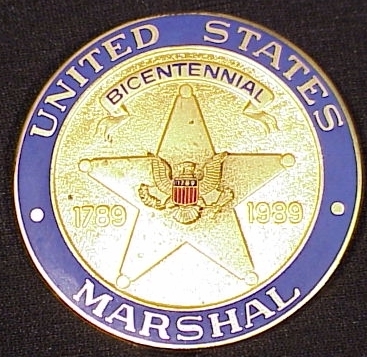 United States Marshal (small size), control number and credential warning on back. 2. District number was on the back, example #08 was assigned to Arizona. B. Deputy United States Marshal (large size), control number and credential warning on back. numbers in the 6000 range. 3. In 1969 there were only 500 deputies; in late 1970 early 1971 more deputies were added until there were about 1800. A. Chief Deputy United States Marshal control number and credential warning on the back. Approximately 95 issued. These badges were manufactured by ROBINS COMPANY of Attleboro, Mass. This company was bought out be V. H. BLACKINGTON & CO., INC. of Attleboro, Mass. A check with this company shows that they do not have the records from ROBINS COMPANY and they do not know who has them. B. The cost of these badges was $10.80 each. On July 14, 1970 the dies were ordered to be cut by V. H. BLACKINTON & CO, INC of Attleboro, Mass. for the large silver shield that was used from 1971 to 1980. The above badges were from the original order that was placed in late 1970. The cost of the badges were about $9.80 each. Sometime in early 1971, another order was placed for additional Deputy badges that had numbers up to 2000 on them. There is no record at either U.S. Marshal Service Headquarters or Blackinton for the date or numbers on the badges. Then sometime after that, a number of Deputy badges were ordered with the number range in the 5000's. Also a number of Deputy badges were ordered with a letter "A" in front of the number. These badges were issued to Main Justice and the Congressmen who had need. After 1972, badges were ordered with the following titles on them and were issued. * The above information on ASSISTANT REGIONAL DIRECTOR was received in an interview from a retired United States Marshal Service employee. He was not sure if the badges were issued. 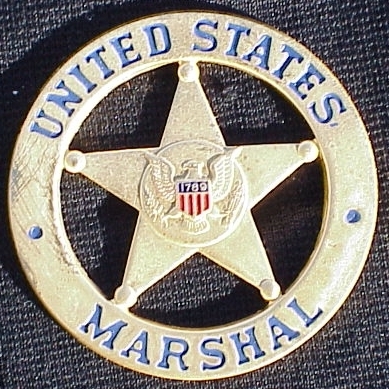 In 1980, the following badges were ordered with the words "UNITED STATES MARSHAL" on the face of them. They came in two colors. Gold issued to the U.S. Marshal; silver was issued to everyone else. * In 1983 one silver badge was ordered and received. It was issued to the Director. ** In 1984 two gold badges were ordered and received. It's not known at present who has them. They are not in inventory and not shown to have been issued. A badge was given to President Ronald Reagan. Number - 1, color - gold. A badge was given to James Arness. Number unknown. 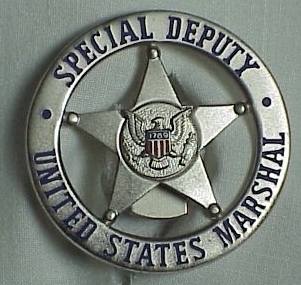 The silver badges numbered 7000 through 7199 were ordered with the wording "SPECIAL DEPUTY UNITED STATES MARSHAL". These badges are just a little smaller than the above issue. N/D Texas, W/D Texas, 2 Marshals in Oklahoma and number 5 was for the Director. They were used in parades. Five silver circle and cutout stars were ordered with pins and 4 were issued to the "Ft. Worth Marshals Honor Guard" and number 5 was kept by Peyton Baer, head of the Posses. In 1984, the following pocket badges were ordered. These badges were issued to Special Deputy's and Court Security Officers. In 1989 a Bicentennial gold badge was made and issued on April 3, 1989. There were 3000 ordered with the numbers to match the current issued badge number of each operational employee. These badges were manufactured by "WILLIAMS & ANDERSON" of Providence, RI. This badge is to replace the pocket badge and is to be worn until October 31, 1989, and then it was given to the employee. On October 25, 1989, a memo was sent that the badge will be worn until further notice, then it would be replaced by another badge. On November 19, 1990 all districts received the new belt badge that replaced the Bicentennial badge. The new badge is the same as the one in the ID case and with the same number on the back. The U.S. Marshal's badge is gold and the deputies have silver. These badges were also manufactured by "WILLIAMS & ANDERSON of Providence, RI. There were 3000 ordered. The Millennium badge was issued July, 2000 to be worn until December 31, 2001. This badge was optional for Operational Personnel (Marshals, Chiefs, Supervisors, Inspectors and Deputies) to buy and wear for 18 months. This is an official issue badge made by V. H. Blackinton & Co., Attleboro, Mass. It is unknown how many have been ordered and worn at present. The following numbers and titles of badges were destroyed on December 7, 1983 at Headquarters, Washington, DC. NOTE: Many of these badge numbers do not coincide with the records of the badges that were bought by Headquarters.